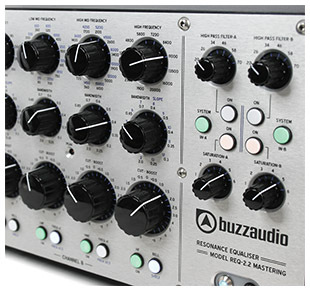 Buzz Audio Ltd is a New Zealand based manufacturer of professional analog audio recording products. The products we produce are primarily used within the music recording industry in home and professional studios alike. All Buzz Audio products are designed by Tim Farrant and assembled by hand using serviceable components in robust enclosures designed to last a life time. Because we are a small boutique company you can expect excellent customer service and product support - now and into the future. If you have any questions about our products we are always ready to answer them and you can contact us here. The products you will find within these pages reflect our goal to provide the end user with a unit that not only sounds great, but one that will last for many years. First and foremost we endeavour to make pieces that are original in design and not clones of other brands. That said, we do love the techniques developed in the early days of recording (optical compressors for example) and have futher developed these technologies with our clever circuit design. The result is a range of products that are truly unique in the market with improved functionality, awesome sound quality and real vibe! Many of the units here have taken years to develop and fine tune for the specific tasks that face the recording engineer on a daily basis. Within each of our products you will find a high standard of workmanship by a dedicated team and excellent future serviceability. All our units are hand assembled and carefully tested before dispatch and we pride ourselves on the lack of technical issues our customers experience! Along with the high quality of our products comes our dedication to customer service. We enjoy and welcome feedback from our users and will always respond promptly to any problem that may arise - even if the factory warranty has expired. Buzz Audio was formed in 1985 by Tim Farrant, the company was initially set up to provide technical services to New Zealand audio professionals. This included acoustic design, recording studio design and technical installations. Tim's background in electronics, live sound engineering and later studio engineering led to the development of the companys first product, the True Class A MA-2 microphone preamplifier (now MA-2.2). The MA2 was well received by a handful of well known US engineers back in 1993 and this prompted Tim to continue to develop new products with an emphasis on innovative electronic design. Today the company continues to grow and aims to become a household name within the international recording industry.